Brandt Snedeker won the Farmers Insurance Open as the chasing pack were unable to overhaul his six-under-par score on the extra day at Torrey Pines. 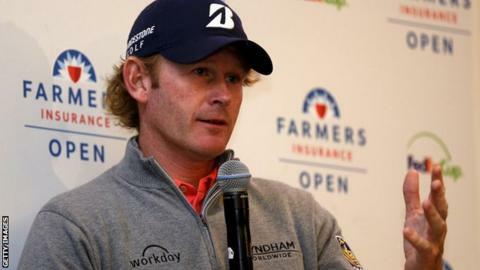 American Snedeker, 35, posted his score on a weather-hit Sunday before play was curtailed. Jimmy Walker resumed his final round with a one-stroke lead but bogeyed four of his last eight holes to slip back. South Korea's KJ Choi had a chance to force a play-off but missed a 30-feet putt on the 18th green. Snedeker, who also won the event in 2012, carded a 69 in his final round, despite gusting winds and bursts of heavy rain. The wind was still bad enough on Monday to prevent any spectators being allowed on to the course near San Diego in California. And no-one was able to conquer the conditions to beat Snedeker's clubhouse lead as he collected his eighth USPGA tour title. "I thought I was out of the tournament starting on Sunday morning," he said. Meanwhile, Jim Furyk, 45, is expected to miss the Masters in April as he requires surgery to clear up an ongoing wrist injury. The 2003 US Open champion will be out for a further three months.